Where's it from? Nomadic Berber tribes in the area of Morocco. As home décor trends in the US become more and more global, American design-lovers are finding themselves captivated by textiles and techniques from cultures thousands of years old. This is especially true of rugs, one of our latest design obsessions, which have been covering the floors of homes all over the world since time immemorial. Some of the methods used to make our favorite rugs are as ancient as the civilizations that first created them. Others, like the Boucherouite rugs of Morocco's Berber tribes, complicate simple categories of old and new, expanding on ancient traditions to meet the needs and conditions of modern life. Unlike many of Morocco's other well-known rug styles, the Boucherouite rug (pronounced boo-shay-reet” from the Arabic bu sherwit meaning “a scrap from used clothing”)(1) is only a few decades old. This new style of rug making first emerged in the 60s and 70s, motivated more from necessity than fashion. Like most Berber rugs, Boucherouites are woven by women for use in the home, with commercial trade or international design trending a distant afterthought. Yet unlike traditional Berber textiles, the wool that has long been the favored material for rug making among Berber groups is accompanied―and in many cases replaced―by synthetic fibers such as Lurex, nylon, and even plastic. The change in construction materials was not voluntary, rather it came about as events following French incursions into Morocco in the early twentieth century led to restricted freedom of movement for Berber groups prompting a move for these nomadic people towards a more sedentary form of life. The transition was accompanied by an increased scarcity of wool, a material which had to be replaced if―among other things―Berber women were to continue to be able to provide usable rugs for their households. In essence, the Boucherouite is a simple rag rug. Strips or unraveled fibers of older textiles, such as clothing or worn out rugs, are recycled and woven together to create something new. Yet the humble origins of these rugs serve only to accentuate the remarkable nature of the finished products which take full advantage, not only of the weaving skills of their makers but of the benefits of their patchwork components. One of the most striking features of Boucherouite rugs is the amazing variety of colors that they demonstrate, particularly when compared to more traditional Berber wares. This sudden explosion of color is largely attributable to the prevalence of synthetic fibers in their construction, which holds brighter, more vibrant colors that are often possible using natural dying techniques. Even more dazzling is the free form nature of the patterns that grace each rug. Shapes appear, fade and reappear as motifs and color palettes evolve all in the space of a single rug. While Boucherouite patterns can appear random they reflect the improvisational skills of Berber weavers while still adhering to motifs with centuries of history. Among these are a lightning motif, sometimes called bouwakhkhiya (“with dizziness') among other names, which bears resemblances to similar jagged designs popular in the region as early as the second or third century. Far more than decorative, these patterns allude to a number of metaphysical beliefs including protection from evil, as well as the Berber understanding of the human body and the fluid nature of the universe. The diversity of Boucherouite rugs is a reflection of the diversity of Berber culture. The term Berber is not an ethnic description but rather a widely dispersed language group. It applies to any speaker of a Berber language. As a result, Berber people enjoy a diverse array of physical characteristics ranging from dark skin and African features to blonde hair and blue eyes. Yet despite the dispersed nature of Berber people, the role that Berber groups have played in history has been monumental, particularly those in the area of Morocco. While Berber groups are currently referred to as living around Morocco, the nation was in fact begun by Abu Bakr ibn Umar and Yusef ibn Tashfin, members of the Senegalese Sanhaja Berber group and the leaders of the Almoravid movement. That movement went on to defend the independent Islamic states of Spain against Alfonso VI and the legendary El Cid, carving out an empire that “extended over present-day Morocco, Mauritania, southern Spain and Portugal, western present-day Algeria and a part of what is now Mali”. Prior to the Almoravids, Berber general Tariq ibn Ziyad led thousands of Berber and Arab troops in the initial Islamic conquest of Southern Spain. It is for him that we have named the rock of Gibraltar, originally called Gebel-Tariq (the Hill of Tariq) by his troops. Berber rule of southern Spain would continue through the Almoravids to another Berber Islamic sect, the Almohades, and last until 1492 when the last Moors left Spain. In addition to the profound impact that Islamic Berbers had on the culture of Spain, their impact on the entire western world was felt as Moorish Spain remained a lighthouse of advancement through Europe's Dark Ages. Berber Spain was not only a bastion of scientific knowledge and the arts but was also responsible for reintroducing Europe to the works of its great thinkers including Aristotle and Ptolemy, the former through the life's work of the scholar Ibn Rushd, known in the West as Averroes. 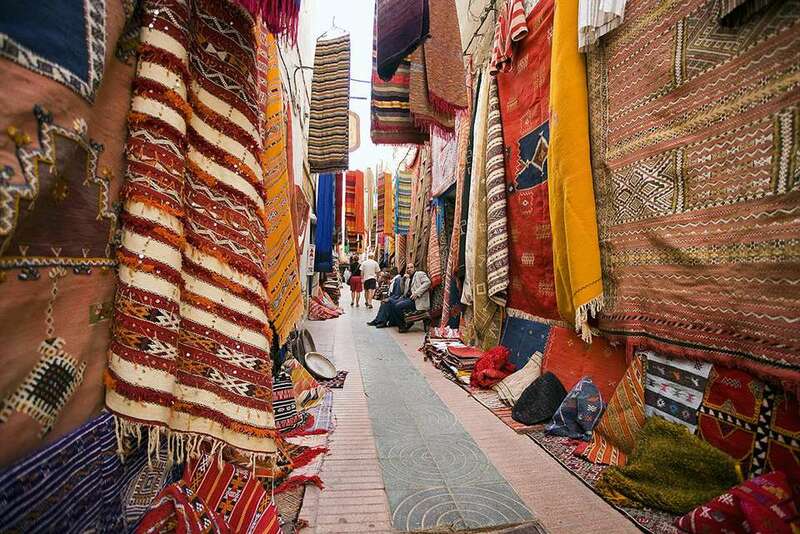 Throughout that history, rugs have been an important part of Berber culture, whether for prayer or for use in the home. Today Berber rug makers continue in the spirit of their great tradition while adapting the form. Even more than the bold statements they can make on floors or walls, Boucherouite rugs are striking evidence of the evolution of people and cultures once believed by scholars to be stuck in time, without the capacity for change. As people always do when faced with the end of one way of life, Moroccan Berbers have created a new way, searching through what is available to find the best means to express who and what they are. And as is so often the case, in doing so they have created something remarkable. What are some tips for decorating with rugs? What's the Best Way to Clean Wood Floors? Should You Put Carpet on Stairs or Not?